Palestinian Authority President Mahmoud Abbas's Fatah Party announced Saturday that the "campaign for Jerusalem has effectively begun, and will not stop until a Palestinian victory and the release of the holy sites from Israeli occupation." Fatah demanded the removal of metal detectors and other security devices from the entrance to the Aqsa Mosque on the Temple Mount. A week earlier two Israeli policemen were killed by terrorists who had stashed their weapons inside the mosque. The Fatah statement was illogical and hypocritical. Many mosques in Muslim-majority countries use the same security technology to protect worshipers, tourists and police. Yet Mr. Abbas managed to force the Israeli government to remove them. He did it by deflecting attention from the policemen's murders and stoking fear of a religious conflagration with vast repercussions. 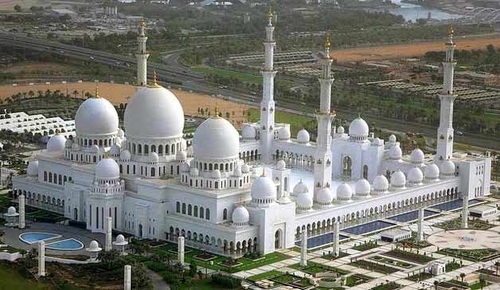 Like other visitors, the author had to go through a metal detector when visiting the Sheikh Zayed Mosque in Abu Dhabi. The Temple Mount crisis highlights with exceptional clarity three factors that explain why a steady 80% of Palestinians believe they can eliminate the Jewish state: Islamic doctrine, international succor and Israeli timidity. Islam carries with it the expectation that any land once under Muslim control is an endowment that must inevitably revert to Muslim rule. The idea has abiding power: think of Osama bin Laden's dream of resurrecting Andalusia and Turkish President Recep Tayyip Erdogan's hopes of regaining influence over the Balkans. Palestinians consistently report their belief that the state of Israel will collapse within a few decades. A confrontation over the Temple Mount uniquely excites this expectation because it reaches far beyond the local population to arouse the passions of many of the world's 1.6 billion Muslims. The most prominent Muslim leaders and institutions overwhelmingly supported Fatah's position on the Temple Mount security provisions. Islamic voices outside the pro-Palestinian consensus are rare. Palestinians rejoice in their role as the tip of an enormous spear. 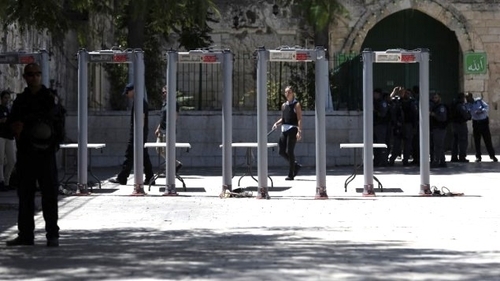 The metal detectors at the Temple Mount that lasted just a few days. Palestinians' illusions of might enjoy considerable international support. The United Nations Educational, Scientific and Cultural Organization routinely passes critical resolutions aimed at Israel. Columbia University houses something called the Center for Palestine Studies. Major corporations such as Google and news organizations like the British Broadcasting Corp. pretend there's a country called Palestine. Foreign aid has created a Palestinian pseudo-economy that in 2016 enjoyed a phenomenal 4.1% growth rate. In the Temple Mount crisis, the U.S. government, the Europeans and practically everyone else lined up to support the demand for the elimination of metal detectors, along with high-tech cameras or any other devices to prevent jihadi attacks. The Quartet on the Middle East welcomed "the assurances by the Prime Minister of Israel that the status quo at the holy sites in Jerusalem will be upheld and respected." With this sort of near-unanimous support, Palestinians easily imagine themselves stronger than the Jewish state. Israel's security services timidly avoid taking steps that might upset the Palestinians. This soft approach results not from starry-eyed idealism but from an exceedingly negative view of Palestinians as unreformable troublemakers. Accordingly, the police, intelligence agencies and military agree to just about anything that ensures calm while rejecting any initiative to deprive the Palestinians of funds, punish them more severely or infringe on their many prerogatives. The Israeli security establishment knows that the Palestinian Authority will continue to incite and sanction murder even as it seeks to delegitimize and isolate the state of Israel. But those security services emphatically prefer to live with such challenges than to punish Mr. Abbas, reduce his standing and risk another intifada. The collapse of the Palestinian Authority and a return to direct Israeli rule is the security services' nightmare. Mr. Abbas knows this, and this week's fiasco demonstrates that he's not afraid to exploit Israeli fears to advance his dream of debasing and eventually eliminating the Jewish state. Mr. Pipes is president of the Middle East Forum. © 2017 by Daniel Pipes. All rights reserved. Only one media event went viral, and that was when a viewer of a program broadcast on the London-based Arabic-language Al-Hiwar television network called the station and declared, "I'm opposed to an Al-Aqsa victory, because an Al-Aqsa victory is a victory for Hamas and Qatar!" July 27, 2017 updates: (1) Izzat Risheq of Hamas tweeted that Palestinians achieved a "historic victory" in the just-concluded Temple Mount confrontation. He's right. (2) A Channel 2 poll found that 68 percent of Israeli adults agreed with the decision to install the metal detectors and 77 percent saw the Netanyahu government capitulating when the detectors were removed. "The Jews Are Going, the Arabs Are Coming"